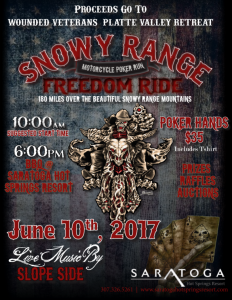 Saratoga Hot Springs Resort is excited to announce the 2017 Snowy Range Freedom Ride Motorcycle Poker Run, proceeds of which will benefit the Wounded Veterans Platte Valley Retreat! The veterans for the Wounded Veterans Platte Valley Retreat are referred by the Cheyenne VA hospital. They will get to spend an all–expense–paid trip here at the resort while they enjoy the outdoors (fishing, hiking, floating etc) of the Platte Valley. 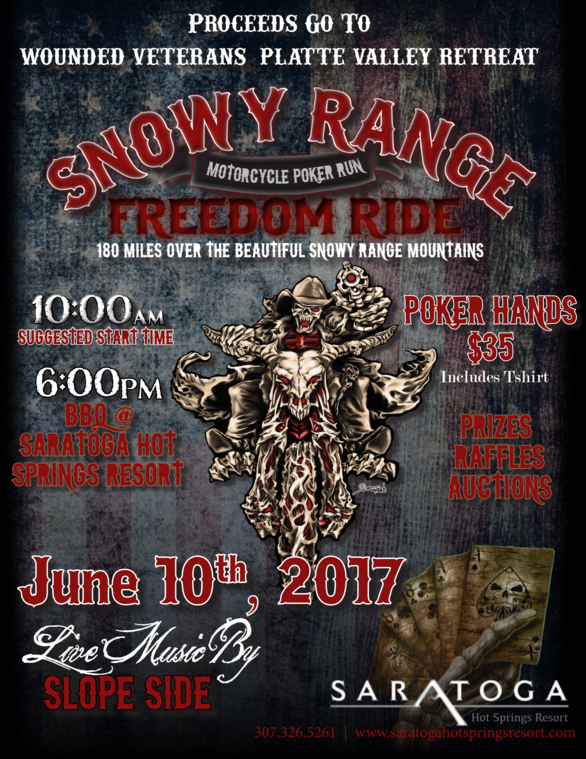 Mark your calendars, the event begins June 10th, 2017! The suggested start time is at 10 AM, but enjoy the day at your own pace. ***Additional poker hands are $30. The route this year estimated at 180 miles for the poker run. $35 poker hands includes T-shirt and you do not have to participate to buy a poker hand, nor do you have to go to all the stops to have a qualifying poker hand. Grab your friends and family and enjoy chips and salsa from 6 PM-6:30 PM. At 6:30, the party really starts with a BBQ Dinner and Live Music by Slope Side. The BBQ Dinner will be offered for $14.95 for Adults and $8.95 for Kids 12 and under. You do not want to miss this event, Prizes, Raffles, Auction items, BBQ and LIVE music…. what more could you ask for?